The revolution that led to the dethronement of Queen Isabella II was the work of army oligarches led by Francisco Serrano y Domingues and Progressive conspirators behind General Prim y Prats, the Prime Minister. The Democrats became active in setting up juntas after the revolution. The Democratic intellectuals' main contribution was to add a radical democratic content to the demands of the military oligarchy. The generals were determined to keep the leadership of the revolution in their own hands by channeling it into a constitutional monarchy. 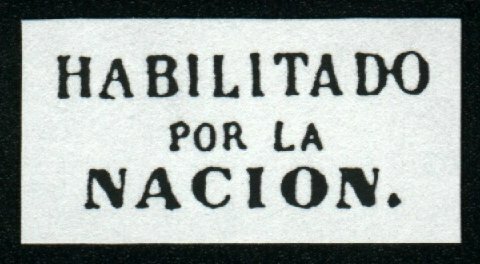 On September 30, 1868, the Revolutionary Committee in Spain, prompted perhaps by a revengeful spirit as well as a desire to emphasise the change in form of the government, decreed that the legend "HABILITADO POR LA NACION" (Validated by the New Government), should be surcharged on all remaining stamps of the 1864 issue while awaiting a new delivery of stamps ordered from the Fabrica Nacional de Moneda y Timbre in Madrid. Over a six year period, a number of other Queen Isabella issues were also overprinted in order to meet the increasing demand of stamps whilst awaiting further deliveries from Spain. Many varieties of hand stamping dies for these surcharges were made at the Casa de la Moneda, in Madrid. On October 21, 1868, a total of 27 of these metal handstamps were sent to the Civil Governor of the Philippines with an order to surcharge all current postage stamps. All the dies sent were, fortunately, of the so-called "Viscaya type", so there are no varieties of type to complicate these surcharges. The dies were received at Manila in December 1868 and the stamps then on hand were surcharged and issued as soon as possible. The surcharging was done very hastily by Filipino employees of the ordinary class, and because there were no specific instructions given on how to apply the overprint to the stamps, there are many varieties in usage, as well as errors. As a result, stamps are found with the surcharge applied vertically, reading upward or downward; diagonal, reading upward or downward; inverted; doubled; or in any combination of these possibilities.